Life of Fred - Junior Maths aimed at students aged 12 and under. by Stanley F. Schmidt Ph.D. In this book (Life of Fred: Fractions) and the next book (Life of Fred: Decimals and Percents) you can learn everything you need to know to begin algebra! In his office, he hurts his foot and is taken to the hospital. ...and that's just the beginning of his day! You know your addition and multiplication tables by heart, you have read Life of Fred: Fractions, now the gateway to algebra :— Life of Fred: Decimals and Percents. All fun! Just open & enjoy. Need more practice with decimals and percents? Zillions of Practice Problems Decimals and Percents has you covered! This book is the companion to Life of Fred: Decimals and Percents and has hundreds of new problems organized according to the chapters of Life of Fred: Decimals and Percents.. These problems contain lots of tiny stories about Fred and his friends, Joe and Darlene. All problems are worked out with complete solutions and answers. Fred does physics before algebra. Learn . . . Numerals, Making models, Nineteen conversion factor problems, Area of a rectangle, Friction independent of speed, Constants of Proportionality, Exact speed of light, Continuous and discrete variables, Story of the meter, Pendulums, Oblate spheroids, Krypton vs. kryptonite, Square roots, Pilgrims in Massachusetts in 1620, Hard c and soft c, Normal forces, Coefficient of friction, Solving d = rt for r, How ducks pronounce mu, Graphing points, Ordered pairs, Why rocks stop falling, Hunch-conjecture-theory-law, Simultaneity doesn’t exist, Inductive and deductive reasoning, How fossils and astronomy are connected, Hooke’s law, Four ways to stretch a spring, Three meanings of plastic, Static vs. kinetic friction, Nine forms of energy, Energy Cards game, Calamari spaghetti, Poetry of Christina Rossetti, Most filmed spot in the world, Getting grass stains out of pants, Experimentally finding the coefficient of static friction without knowing the weight of the object, How you know you have a liver, Resolving a vector into its components, Addition of vectors, Similar triangles, Slope, Physicists think that there isn’t any work in holding a bowling ball, Kelvin temperature, Law of conservation of energy, Perpetual motion machines, Kilowatt-hours, Photosynthesis, Metric system, Gregorian calendar, Two ways to measure mass, Definition of pi, Inertia, Newton’s first and second laws, Why cramming doesn’t work well, Definition of pressure, Exponents, Density of neutron stars, Computing the mass of an iron atom, Cavalieri’s principle, Pressure at a given depth, Special glass in auto windshields, uoyancy, Finding the volume of a desk lamp, 80-pound rubber ducky, Official rules of golf, Advantages of cerebrospinal fluid, Air has mass, Why 35-foot straws don’t work, You are alive because ice floats, Gedankenexperiments, How water fountains work, Elliptical constructions, Galvani and dead frogs that twitch, Birds sitting on high-voltage power lines, How to buy a cafe, Placing question marks at the end of a quotation, Schematic drawings in electrical circuits, Electrons per second in an ampere, Why we wear clothes on days ending in y, Ohm’s law, Batteries in series, Computing resistance in parallel circuits, Dangers of electricity—Thomas Merton, Museums in New York City, History of the atom: Democritus, Isaac Newton, Henri Becquerel, J. J. Thomson, Ernest Rutherford, Niels Bohr, Principal quantum number, Arnold Sommerfeld, Louis de Broglie, C. J. Divisson and L. H. Germer, Orbital quantum number, Orbital magnetic quantum number, Spin magnetic quantum number, Wolfgang Pauli, Werner Heisenberg, Paul Dirac, Carl David Anderson, Positron. Want more Physics? Want more fun? Want to hear about the trouble your kid sister is causing in your room? This book is for you! Zillions of Practice Problems Pre-Algebra 0 with Physics, the companion book for Life of Fred: Pre-Algebra 0 with Physics, has lots of bonus problems for students who want more. It also explains why your kid sister threw pizza into the tub while your mom was having a bath. A spring morning in Fred's life. Learn . . . Need more practice with Life of Fred: Pre-Algebra 1 with Biology? We've got you covered. 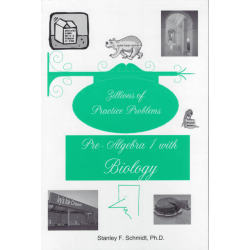 Zillions of Practice Problems Pre-Algebra 1 with Biology has lots more to do with math, with biology, and with the continuing adventures of Jan and Ivy. This book is keyed directly to Life of Fred: Pre-Algebra 1 with Biology. Each of the chapters contains both exercises on the current topic and review questions from the beginning the book up to that point. All the problems have completely worked out solutions. The problems are fun with lots of stories about Jan's acting career, Ivy's ice cream store, and Cassie's genotype. 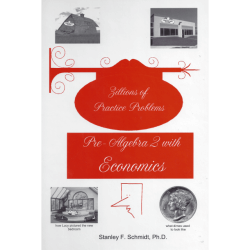 This book is keyed directly to Life of Fred: Pre-Algebra 2 with Economics. Each of the chapters contains both exercises on the current topic and review questions from the beginning the book up to that point. All the problems have completely worked out solutions.